So far, I can only play a couple of scales, a few songs, and the beginning of I'm Only Sleeping . Awesome! Learning your favourite songs is definitely the best way to go about it. A friend of mine here has a 1969 Martin 35 12 string for sale. It's a beauty. I learnt to play on a 12 string but with six strings......Lots of space between the strings to avoid buzzing. I'd put the octave strings on for a few months for that fullness, but get bored with flat picking and strumming. I asked my son if he wanted it? He already safely has my Martin 0018 and a handmade guitar I commissioned 40 years from a luthier who was also a friend. However 12 strings don't suit his style......He doesn't sing and never flat picks but thanks to Youtube learns these complicated melodies. So he didn't want it. @To Jorma that is AWESOME! You're making pretty good progress for only having been playing a week. How do your fingers feel? they're such sweet little guitars -- superbly playable and and so versatile. I've been playing the drums for a few years and I started the euphonium at school last year. I'm pretty good at both- first chair euphonium and I'm working on SFF on the drums right now. Oh, and week or two ago, I bought myself a Fender Strat (my first guitar). That's really awesome - our school used to have a euphonium but now it's just me on french horn and the trombones. Congrats on your Fender Strat! (I'm also a 'drummer') Can you play the fills in Oh! Darling ? *sigh* I'm saving up for albums as usual. I need a 12 string. But i stole my dad's bass since he never played it and just left it here. hehe mine now. @The Hole Got Fixed - I haven't tried Oh! Darling , but it would be fun to figure it out. I know which is which @ewe2. I was under the impression that there was such a thing as a hybrid between the two -- but now you and the internet are making me question my sanity because I can't find any examples. Was just wondering if you might mean a PJ pickup configuration which is very popular these days. You get the split pickup Precision sound but you can add some higher grit via the Jazz pickup. The only issue with this is that the Precision pickup is in the usual place but not the Jazz pickup, it ends up being a bit close to the bridge so you won't get that Jazz bridge sound. My SB-2 is like this except I have just volume knobs and I EQ the tone by mixing the two. I like the Precision with flats tone so I don't really use the bridge pickup unless I know it will cut through a mix better with it. 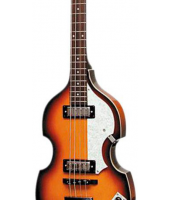 But I will at some stage get a Jazz bass and put roundwound strings on it, for a punky funky reggae bass. Squire make a nice little PJ Jaguar bass that looks like a lot of fun (but not the Special, that has an active bass boost which is terrible), but I don't need it. i fell in love at the music store today, so i must have her. he doesn't care, he's not interested in it anymore. which is good for me! Any Beatles fan worth their salt would be. Whatcha gonna name her, Walrian? Yes, i was either thinking Paul or Macca. i'll have to wait until i pick her up later this week and we get to spend some quality time together.
. I was doing Joe The Lion today and got a bit teary. Great score @TheWalrusWasBrian is they a treely ruly Hofner?